WASHINGTON — There’s no story quite as quintessential to the American sports canon as the turnaround. We love to see a once downtrodden franchise rise from laughingstock to triumphant hero. And we love, almost as much, to pinpoint the low-water mark — rock bottom — to identify what that looks like and quantify the rise from nadir to apex. The Houston Astros won the World Series for the first time in the franchise’s 56 seasons Wednesday night. They could not have done so without the unprecedented cratering that took place in the dozen years since their last appearance in the Fall Classic, which totaled three consecutive seasons of 106 or more losses. 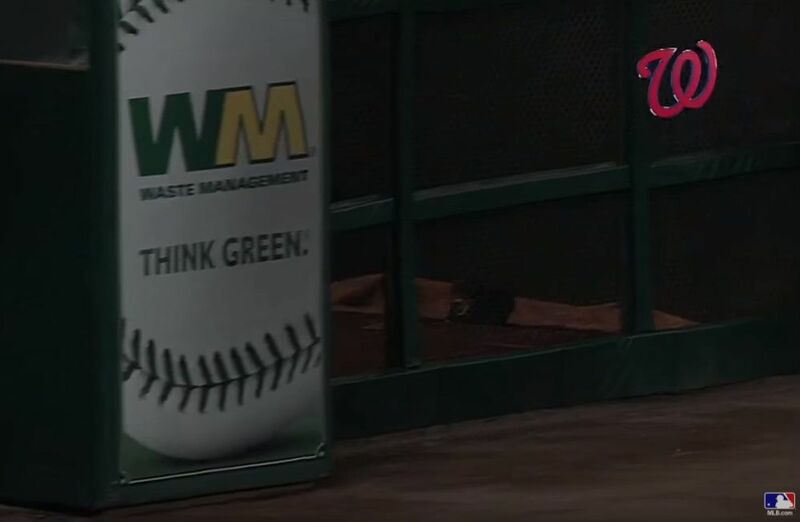 And while there were countless low points to pick from within that stretch, one in particular stands out, one which Astros fans may be happy to forget, but which Nationals fans may well remember. It’s easy to look at the 15-game losing streak to close the 2013 season, in which the Astros finished 51-111, as the low point. But that season was long lost before the final spell. It was lost before it began. Jordan Lyles led that squad in wins, with seven. His ERA was 5.59. No, the low point came a year prior, in the first of a four-game set against the upstart Nationals at Minute Maid Park, in which the Astros had clawed back from a 4-1 deficit with two runs in the sixth and another in the bottom of the ninth, on a Jose Altuve RBI-double off Tyler Clippard (side note: both earned rings Wednesday night). It was a chance, in a noncompetitive season, to win a Major League Baseball game. The game went to extra innings, and Roger Bernadina led off the 11th with a single. Kurt Suzuki squared around to sacrifice bunt, poorly, and then it all happened. The pitcher, Wilton Lopez, crashing into first baseman Steve Pearce, the ball squirting away. The throw never having a chance. Bernadina offering a chance to have nobody ever speak of this play, to have this article never be written, by blowing through a stop sign and steamrolling toward home plate, where he should be out by 20 feet. And then him scoring anyway. It’s that particular snapshot — Matt Downs suspended at a 45-degree angle, Supermanning over a sidearming Steve Pearce as pitcher Wilton Lopez ducks, all in vain, the ball destined to sail wide, into the expanse up the right field line to lose the game in front of a stadium so empty you can hear the individual jeers from hecklers — that still strikes me. Baseball could be played for another 200 years and three players might never find themselves in this unholy arrangement of positions on a field. It’s interpretive baseballing at its very worst. We owe a debt of gratitude to SB Nation’s Grant Brisbee, who did the world a great service by cataloging the events of that fateful evening in the moment (and giving us an all-time URL). You should read his own account and interpretation, if you haven’t already. Even if you did at the time, you should read it again now, knowing everything we know about what’s happened since that night. 2012 was a dream season for the Nats, the kind of season that only happens after years of ineptitude and torture, where the light at the end of the tunnel that is the promise of better days ahead feels more like a carrot on a string. But a dream season for one team means a series of nightmares for whatever opponent that team is encountering on any given night. While the Nats lived the dream, the 2012 Astros endured an entire season of sleep paralysis. 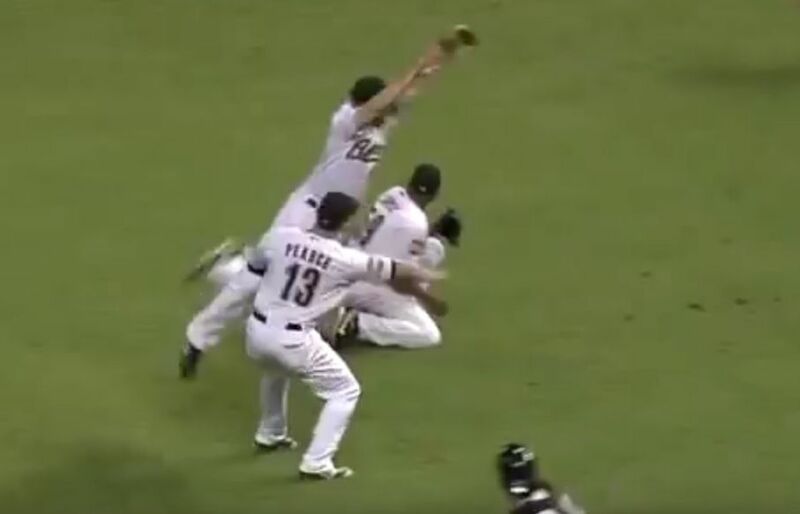 This fateful play came during a stretch when the Astros had won only four (four!) of their last 35 games. As Brisbee pointed out, no team had seen a stretch that bad since 1916. Houston finished August 5-22, part of a longer, 57-game stretch in which the Astros went 8-49. It was a 100-year storm of nightly incompetence, of failure heaped upon failure. That this might be remembered in Washington as the Roger Bernadina series says as much as anything about this point in Astros history. A bench role player, one of the last guys on the roster, having the only good season of an unmemorable Major League career that would be over by 2014. Showing up at the park every night to get beat by Bernadina is not living; it’s just killing time. The Astros organization was busy building the team that celebrated at Dodger Stadium Wednesday night, selecting Carlos Correa and Lance McCullers Jr. in the first round of the 2012 MLB Draft that June. George Springer, who had been taken the summer prior, was mashing baseballs all around the California League, which may as well have been Mars in terms of its distance from Houston and this Astros team. While the club wouldn’t sign the CSN Houston deal that would net the infamous 0.0 television rating until after the 2012 season, there was hope swelling by then. The now-famous Sports Illustrated cover was still 19 months from appearing on newsstands. 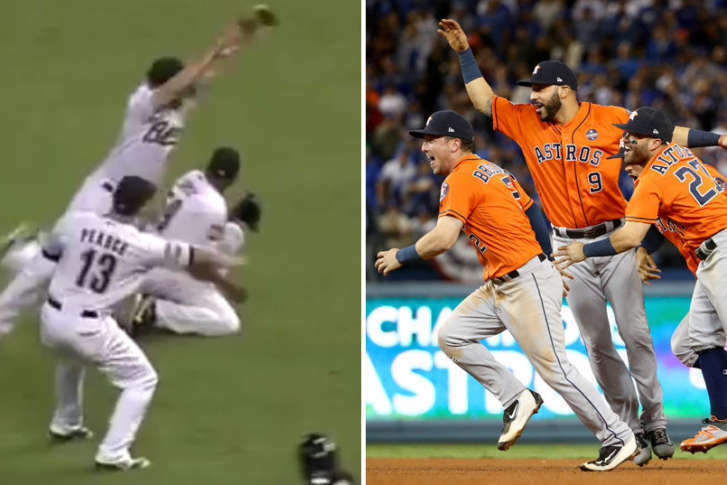 But on this August night, deep in the heart of Texas, the Astros hit the low from which — just over five years later — they rebounded from to find themselves sitting atop the sport. It’s enough to give any franchise hope that no matter how far off it may appear, a title might just be out there on the horizon, even if it’s impossible to imagine just yet.